It is time for another season of winter wildlife watching. Now, if only the weather would catch up and cooperate. I will have to admit, my group seemed to enjoy the warm conditions as we explored Mattamuskeet National Wildlife Refuge last Saturday. But, the unseasonably high temperatures made for some strange bedfellows. 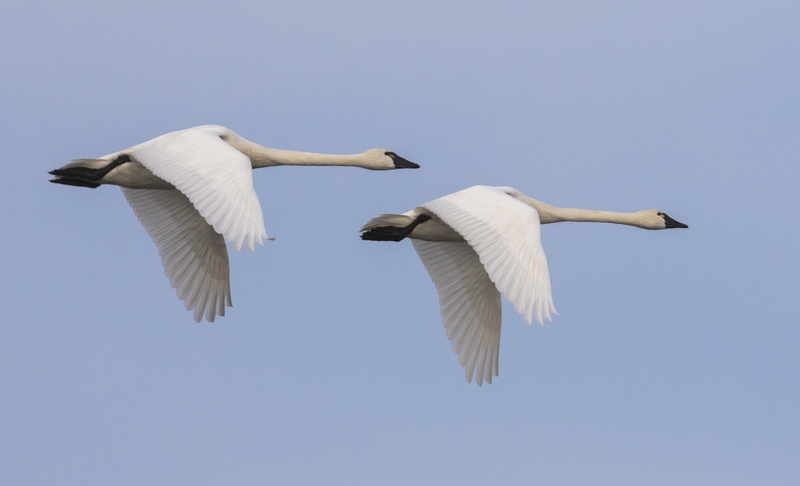 While watching Arctic visitors such as Tundra Swans, we also saw three species of butterflies (Cloudless Sulphur, Palamedes Swallowtail, and Orange Sulphur) and heard the quacking sound of Southern Leopard Frogs calling. Temperatures were in the 70’s both days and I slapped more than a few mosquitoes…in mid- December! Even the many turtles we stopped to photograph looked a little hot while sunning themselves in this December heat wave. The day started mildly enough with a beautiful sunrise and a few birds along the causeway. The lake level is very high again this winter so there are not as many birds as in the past feeding along this area. But, you can always count on a few herons and egrets to grace the edges with their stately silhouettes. 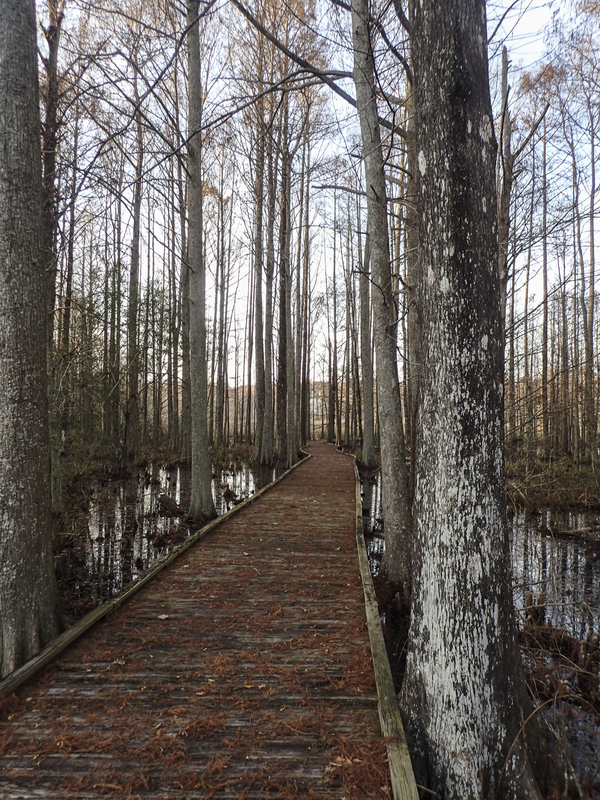 After spending time driving Wildlife Drive and admiring the numerous species of waterfowl feeding in the shallows, we took a couple of hikes along the trails where we saw Nutria, the aforementioned butterflies, and a host of small birds. As usual, when I am with a group, I didn’t take all that many photos with my telephoto lenses, but carried a point and shoot to document the day. And, as usual, I can’t resist stopping for a few photos of the exquisite reflections along the New Holland Trail boardwalk. 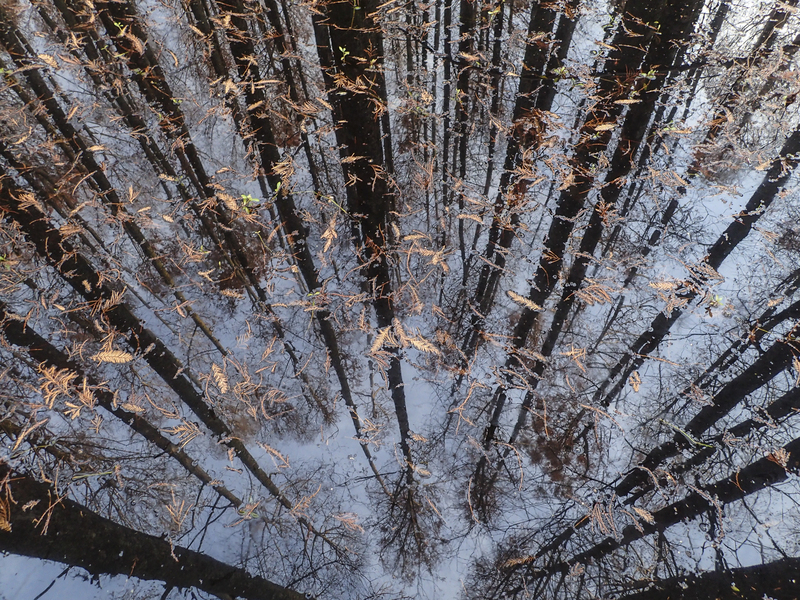 The dark, still waters along this 1/4 mile trail offer a reverse image of the stark trees and sky that calls to my camera. 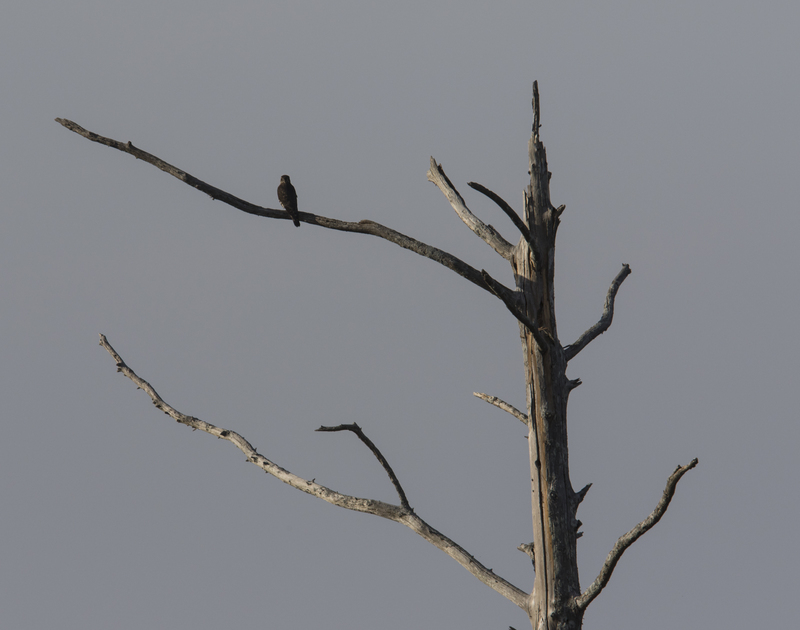 On our final pass around the roadway loop for the day, I had just started to comment on how I appreciate the two dead tree snags out in the impoundment because they are often graced with a raptor….wait, there’s one now. I pulled over, thinking it was an American Kestrel, but my binoculars told me otherwise – a Merlin, our second largest falcon. I jumped out and grabbed the spotting scope so everyone could get a look. About the time we all had our first quick glance, the Merlin took off. We watched it pick up speed and fly out about 25 yards, then make a swoop and an abrupt turn and return to the snag. It immediately started reaching down to its clinched talons and begin to feed. It had caught something! I reset the scope and looked, but didn’t see anything at first. Then the bird moved and I saw wings. Not the usual bird wings you would expect as prey of this mid-sized falcon, but insect wings. More precisely, dragonfly wings. This was so cool…I have seen Merlins nab a few different species of birds over the years, but never a dragonfly. The feisty raptor took off again, this time flying more in our direction, accelerating as it cruised the marsh, and, once again, ending its flight with a sharp turn and a return to the snag. And again, a dragonfly. We watched it go out on 6 forays and return with 5 dragonflies. One was spotted and caught at a remarkable distance of about 50 yards. Unfortunately, I got so involved watching this unusual event that I never got the 500 mm lens out to attempt a better photo. I tried to identify the seemingly mid-sized dragonflies through the scope, but could only see a dark abdomen clutched in the bird’s talons as it quickly pulled the wings off and ate the head. One member of my group saw it slurp down the abdomen of one dragonfly like a kid eating spaghetti. The Merlin finally took off and flew over the treetops leaving us all appreciative of its keen eyesight and aerial acrobatics as it dined on its out-of-season menu items. In reading about the bird that night I came across David Allen Sibley’s description of this species in his field guide…Pugnacious…An active and energetic hunter: spots prey from perch or during low fast flight, closes with incredible speed, and attacks with abrupt turns, often from below. Feeds almost entirely on small birds; also take dragonflies in mid-air. I’d say Mr. Sibley nailed it! This entry was posted in Natural History, Trip report and tagged mattamuskeet national wildlife refuge, merlin by roadsendnaturalist. Bookmark the permalink. Fascinating story of the merlin, Mike. What an amazing bird! 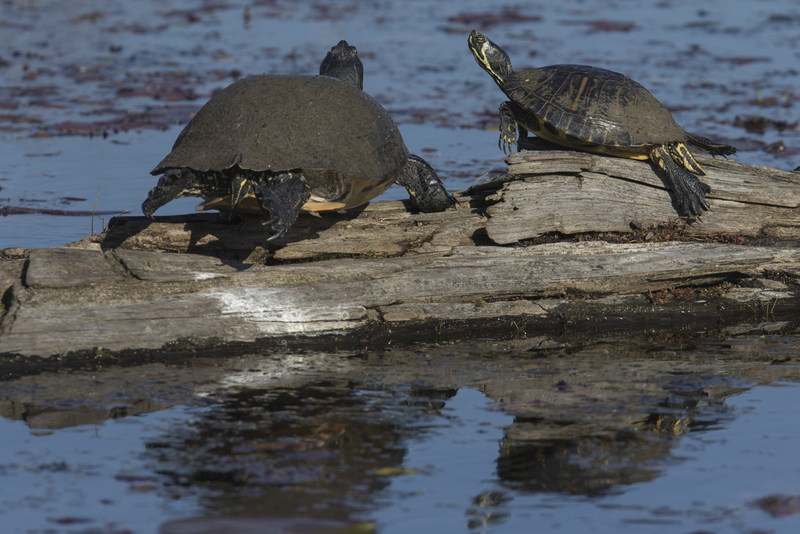 When I double click on the turtles – it is like I am standing next to them on the lake. Those pictures are the best! I love your posts! Thank you so much for sharing with me. Since I live in Kansas I really enjoy learning about all the different places you visit.